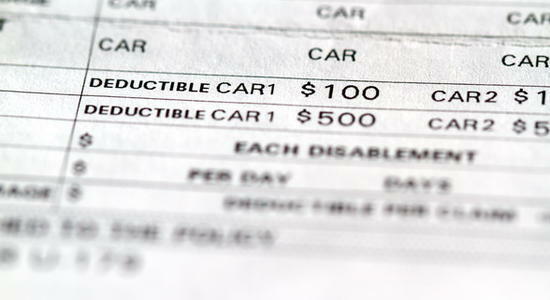 Home » Guide » Car Insurance 101 » Should I Get a Low Auto Insurance Deductible? Should I Get a Low Auto Insurance Deductible? Lowering and increasing your auto insurance deductible should be made to depend on different variables and factors which affect the extent that an insurance company would agree to assume the risk. These factors are quite many. Below are some of the factors which would deem it advisable to opt for a low auto insurance deductible. Do you live in a heavily populated place? More people means more automobiles in the road and therefore more traffic. Accidents are most likely to occur on a daily basis in congested areas. If you live in an area like this, then it would be wiser to have a lower deductible because your car is more exposed to risks (accidents) than those living in less populated areas, making you liable to pay for damage. If you have a low auto insurance deductible, your insurance provider will have to shoulder more of the costs which redounds to your benefit because you only have to shell out a couple of hundred dollars, depending on your agreed deductible. If you drive your car every day of the week, it’s as overworked as a horse. This means there is almost never a day that you do not use the car. In this case, this means that the car is out there, exposed to the risks that it has been insured against to make the insurance company liable. So, it is wiser to have a lower insurance deductible because your insurance provider has a higher percentage of being liable to pay for damages. If you opt for an insurance deductible at only $100, then it is all you have to pay and your provider will have to shoulder the rest. If you have an $800 car repair bill, you only shell out $100. Good deal, huh? If somebody in the family just learned to drive, which would most likely be a teen, chances are your auto insurance premium will be higher. This is so because the new driver is not skilled and not experienced enough to avoid accidents. Most likely but let us hope not, your teen will somehow damage the car in backing up in a congested parking lot, especially if it’s been only a month since he got his license. A low insurance deductible is the way to go. In this way, you can fully take advantage of the premiums you have been paying to your insurance company. If you bought your car at $5,000 and you have a repair bill of $2,000, and your insurance deductible is $1,000, is it worth it? If the car is already old, it will not be wise to have a high insurance deductible. Going for a lower insurance deductible for an old car is advisable even if you just look at the figures given above. People pay bills to make life more comfortable, but people’s pockets are being emptied by these monthly obligations. When you commit to a high insurance deductible, you have to make sure you have this amount in the bank for contingency purposes, in case you become liable to pay for damages to your car or to another person’s car. If you cannot maintain the amount, then you should opt for a lower deductible.